Ninety-nine percent of the time, your experience design process should not begin with an actual technology. It’s one of the major points Inessah Selditz and Nick Bartzokas, interaction designer and technical director at the LAB at Rockwell Group, explained during a session at EventTech (Nov. 2-4 in Las Vegas) on “dimensionalizing” a brand into a physical space. The most meaningful interactive digital and physical spectacles, they say, begin with a set of brand attributes and a storyline. The LAB, a technological innovation studio imbedded in Rockwell, an architectural firm, headed up the rebrand and re-imagination of The Cosmopolitan hotel’s west lobby in Las Vegas. The team transformed what was a dark, long space by wrapping the eight floor-to-ceiling columns in LCD screens and double-mirrored faces. The interactive architectural feature offers a mix of generative and re-rendered content with camera sensors built-in that offer interactive moments. Here, a closer look at this project, and the five ways you can refine your design process to extend your brand into the physical world. 1. Identify your brand attributes. First, identify two or three brand attributes you want to incorporate into the design of a live experience. These attributes will make up a “unifying touchstone” that you’ll come back to again and again over the course of the project. 2. Write your brand story. 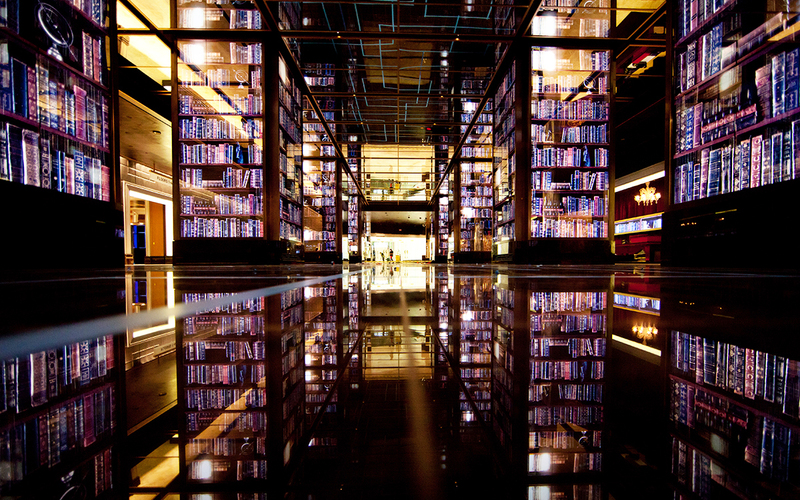 Knowing they had just that lobby in which to tell the story again and again at The Cosmopolitan, the LAB team decided to expand the story not using space, but through time by cycling content so that anytime visitors returned to the lobby, they’re bound to see something different, another chapter of the story. The team centered on a “four seasons” digital story for The Cosmopolitan’s columns. Visuals displayed on the columns range from snow falling on fir trees to whimsical leaves to flowers with butterflies to bubbles and, our favorite—a couple dancing, twirling from column to column. Part of this exploration process is determining how you will balance passive versus interactive; intimate moments versus spectacular moments, Selditz says. One example of how the column offers an intimate moment: During the leaves sequence, the displays will sense when someone is standing nearby and suddenly a deer will be constructed live with the leaves, collapsing when you walk away. The scenario is live-wired by a computer program that is making a decision about what’s going to happen next based on ambient factors. “The content doesn’t just constantly repeat, it’s a new experience every time someone goes; it’s also a personal experience if someone is physically present so they can go tell people about it and that makes it a personal story that they’re privileged to have witnessed in the space,” Selditz says. 4. Add dimension to the story. Behind the lobby display is a robust content management system that allows new artwork to be commissioned and installed. More than 100 pieces of content have been generated, on top of the four seasons and dancer content the LAB developed for the project launch. The most basic technology that added dimension were the two-way mirrors that helped expand the space. Other ways to add dimension: for an installation for Intel at CES, the LAB constructed a digital tree where attendees could actively participate and help grow the tree by flicking blossoms from tablets below up into the canopy, adding their own contributions to the brand story.